“The Mantis” was made possible by generous support from Sennheiser. The latest work in sonic warfare researcher Nik Nowak’s arsenal is “The Mantis,” a two-tonne monumental sound sculpture that, in a biomimetically hydraulic manoeuvre, rears up, preparing itself to do battle at a height of four metres. Nowak will premiere his new sonic behemoth in a face-off against his earlier “Panzer” loudspeaker tank across a border fence, harkening back to the sonic wars that took place during the Cold War at the German/German border in the early 1960s. Live musical interventions by Nowak and sub bass addict Kode9, as well as video projections by Moritz Stumm, will punctuate the installation’s weeklong showing within Halle am Berghain. 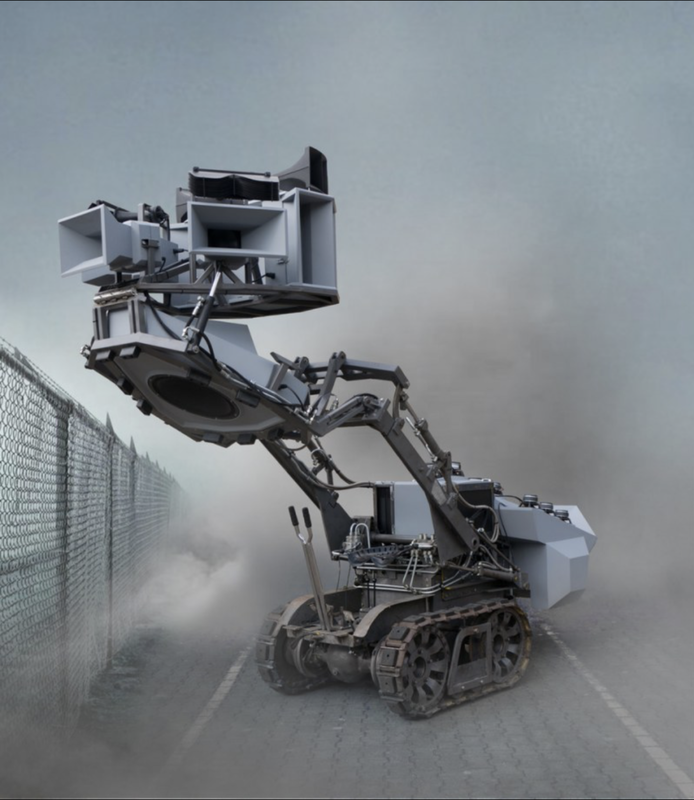 Referencing these sonic wars 30 years after the fall of the Wall, Nowak’s “The Mantis” is a mobile sound system with chain drive that is equipped with twenty-three 8″ speaker cones, a 21″ subwoofer, and 4 tweeter horns, which are fired by three power amplifiers to produce 7500 watts of sound. Berlin-based artist Nik Nowak critically examines the use of sound as a weapon and propaganda medium on the one hand and as a cultural catalyst on the other. Hyperdub label boss Kode9 (Steve Goodman) has had a defining influence on UK bass music and is the author of the acclaimed book, Sonic Warfare: Sound, Affect, and the Ecology of Fear. Moritz Stumm is a Berlin-based video artist specialised in multimedia performances.